Susan McVea Np, this was good! Jeneé aw thank you for this feedback! I could talk about pricing forever. Let me know if you have any questions and I can do another Wednesday show on a different part of it. Susan McVea I started to write that if thinking for my clients I shop based on price and quality – my one to one rate is based on the industry and my digital trainings and programs are what I’d consider affordable again based on my industry (I look at Dave Ramsey’s products a lot). 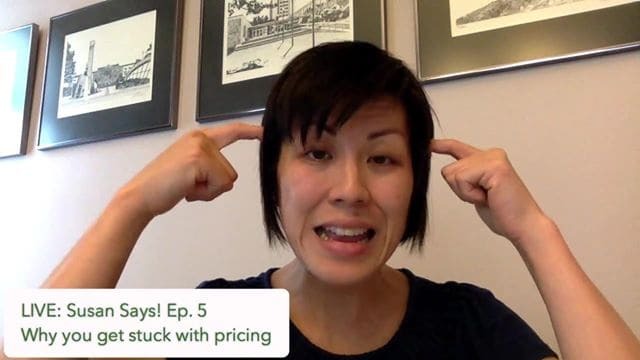 Maybe an actual example or walkthrough of how a person would identify the right pricing for a customer for a particular service. Susan McVea That’s soooo good, thank you!! yay. I’m so glad. You’re welcome! They do! I’ve often had clients say that to me too. That they knew I would be more high end because of my experience so for them they would have a mismatch if I was charging a few hundred for my VIP 1:1 Consulting. you’re so welcome. It really comes down to how well you know your target market and how they perceive price vs value. They do- crazy, I know. Understanding your value proposition is super important. Yay. Thanks for this feedback. Exactly Tami. You’re not alone in thinking this. But if you needed it then chances are someone else does too. Yes!!! Love this! Thank you! Yay! I’m so glad. Thank you for tuning in Ed! Yep. It makes such a big difference when messaging is on point. Thank you for recapping these for others! Remember it may take you 1 hour but it takes your client 2-3 hours. See your value. Exactly! Hard to remember how long it took when we first started but it wasn’t always so quick and easy. Yep. A critical step of market research. It’s ok to ask people what they would be willing to pay you for X. Totally correct. I know people who purposely buy cheaper items knowing they will get rid of them in a year or less. But then save to spend on higher quality items that they will have for years because the quality is better. High dollar = Highly Qualified Service!!!! Yes!! That’s exactly it. Most of the time. My community is highly qualified so this statement rings true. But there are people who are just charging all kinds of high prices but don’t have the chops. It’s important as a buyer to do your research. But as a biz owner, you can charge higher prices and be ok to do so. Hey Erica! Thanks for watching. I’m about to launch the beta cycle of my course and still not entirely sure what I will price it … it’s a short 21-day course, super simple. I hope this was helpful for you. I’ve done a whole course which includes more details on what to price your offer for. Create Your Irresistible Offer. The main thing to keep in mind is what is the value of the end result worth to your target buyer? Erica absolutely. You can always increase the price. The main thing is to know why you’ve priced it the way you have. So you can immediately put people at ease and let them know what to think. Cuz they’ll be thinking something anyways. This is good. A lot for me to consider, thank you, Susan!